Brand value definition: what are your brand values? Brand values are rooted in the core of your business model. Your brand values create the moral compass of your business. They help to define the culture of your business – and how you get things done. Why do your brand values matter? How you relate to others. Your brand values will help to attract and keep customers, employees, suppliers and investors. When you work in tune with your brand values you’ll feel satisfied. When you take on work that is not in tune with your brand values, you’ll feel uncomfortable or even anxious. Your brand values are one of the keys to differentiating your business from your competitors. Take Tesco and Sainsbury’s supermarkets in the UK. Tesco is the biggest supermarket. It seemed that the bigger it got, the more arrogant it’s behaviour became. For many years it was not well-liked and people would spontaneously say ‘I don’t like shopping at Tesco’. This affected their PR. It always seemed to be Tesco who got the bad publicity. They were the retailer highlighted in the ‘horsemeat in beef burgers’ food scandal. Eventually, Tesco business results started to suffer. The answer lay in the better ‘fit’ of my personal values with those of the Sainsbury’s brand. Since that time, Tesco has got a new CEO and the core purpose and brand values have evolved. Now Tesco is back on the list of supermarkets I shop at, although not yet a favourite! 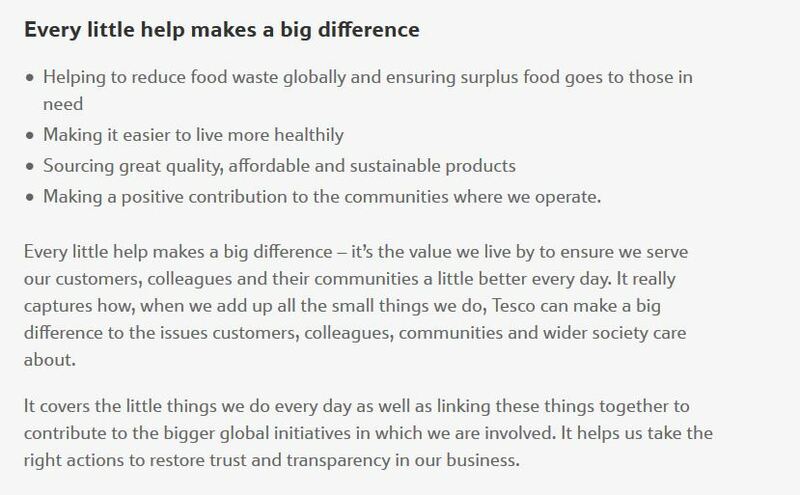 Tesco’s purpose used to be ‘We make what matters better, together’. Now the core purpose has evolved to ‘Serving Britain’s shoppers a little better every day’ – which is more about us and less about the might of Tesco. Click here if you want to read more about Tesco values. The key difference for us, at the moment, is how Sainsbury’s approach sourcing and how they treat their suppliers. Tesco used to be about power, size and scale and their culture is changing. Sainsbury’s just has the edge with a proactive approach to sourcing with integrity. Sainsbury’s have created a brand positioning based on values that resonate with many people, including us. We feel better about ourselves when we shop there – because we can find fish sourced sustainably, Fair Trade coffee, tea and bananas. It may seem a little thing for a Tesco buyer, but for us, it’s a big thing that Sainsbury’s only stock Fairtrade bananas and are the world’s largest retailer of Fairtrade by value, with sales of over £290m. In short Sainsbury’s brand values match ours, which makes them a brand of preference. That’s how brand values work! Click here if you want to read more about Sainsbury’s values. Brand value definition: how do you define your brand values? When we work with you on your brand strategy and positioning, our process starts with defining your ideal client personas and the attributes and benefits of the products and services you offer each persona. It’s a straightforward exercise and includes benchmarking your competitors too. The fun bit starts when we get human and a little bit emotional. This is the part of our process that really helps with differentiating your business. It’s when we dig into why your brand behaves in the way it does and how your brand is perceived by your customers and prospects. Instead, we search for specific values, that relate to your unique way of working. Developing this specific list may also reveal what you have in common with your customers and suppliers. Remember that ‘like attracts like’. You coach shy women, like you, to build their confidence and enable them to shine in their profession. One way to define your brand values is to define your dealbreaker. What will you never do in business? The opposite could be a core brand value. Think about where you prefer to shop and who you prefer to buy from. 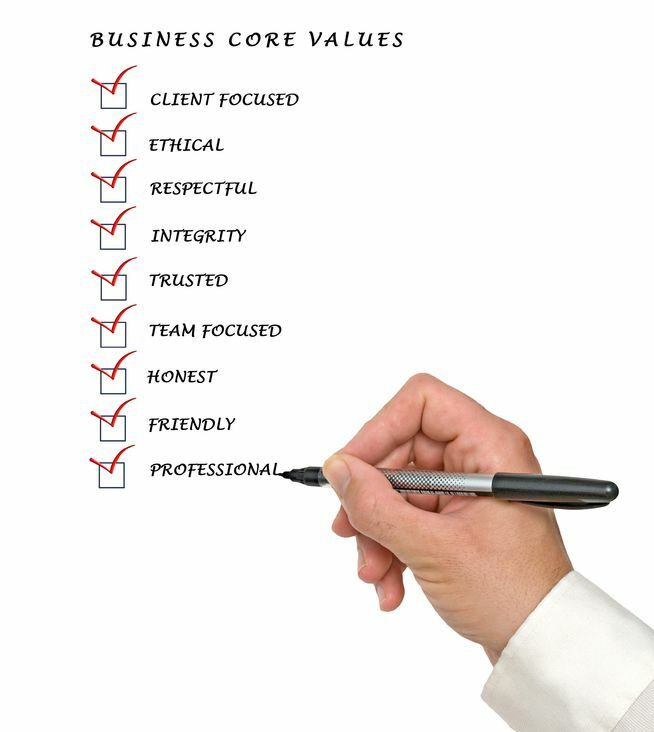 What are your 5 core brand values? If you find it difficult to define your brand values, do get in touch and we can help.